50049, 50007 & 66151 at Plymouth Station. Saturday 23rd March 2019. 47772 tnt 47826 "The Looe Brush", Liskeard Station. Sunday 3rd February 2019. 20189 & 20142, 6Z01, Crediton Station. Wednesday 9th January 2019. 47815 & 47812, 5L46. Totnes Station. Wednesday 19th December 2018. 60009 'UNION OF SOUTH AFRICA', Plymouth Station. Saturday 1st December 2018. 60103, 44871, "The Cathedrals Express", Plymouth Station. Monday 8th October 2018. 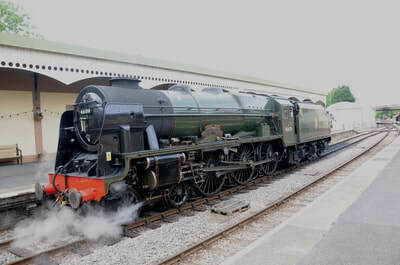 60103 'FLYING SCOTSMAN', "The Cathedrals Express". Saturday 6th October 2018. D9009 & 68004, "The Deltic Deviator", Carlisle Station. Saturday 29th September 2018. 37521, Test Train, Exeter St Davids Depot. Thursday 6th September 2018..
37611 'Pegasus', Totnes Station. Thursday 30th August 2018. 60009, "Settle & Carlisle Golden Express 1", Saturday 11th August 2018. 50049 & 50007, "The Mazey Day Cornishman". Saturday 23rd June 2018. 37219, 37668 & 45212 "The Cathedrals Express", Taunton Station. Sunday 10th June 2018. 66177, 56302. "The Peak District Explorer", Pathfinder Tours. Saturday 9th June 2018. 37218 & 37259, St Budeaux Ferry Road Station. Tuesday 15th May 2018. 66788, 20189 & 20205, "The Diamond Twenties", Saturday 5th May 2018. 47747, 66518 & 66778, "The York Moor Venturer". Saturday 21st April 2018. 37254, Test Train & 43016. Plymouth Station. Wednesday 21st March 2018. ROG 47813 5Z59 Nr Tavistock Junction. Tuesday 13th March 2018. 70013 'OLIVER CROMWELL', 37407. Norwich & Lowestoft Stations. Thursday 22nd February 2018. 37800, Plymouth Station. Wednesday 2nd August 2017. 66775, 0Z31, Keyham Station & Devonport Dockyard Siding. Monday 10th July 2017. 50008 'Thunderer', 4Z01, Exeter St Davids Station. Friday 7th July 2017. 67027 tnt 67023, 1Q18, Plymouth Station. Friday 30th June 2017. 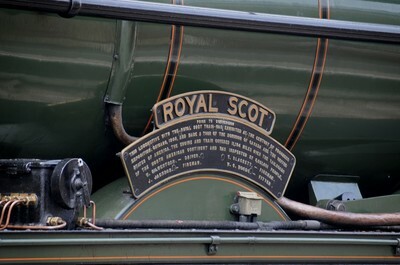 46100 'ROYAL SCOT', Churston Station, Dartmouth Steam Railway. Saturday 24th June 2017. 800004 & 800003, St Budeaux Ferry Road Station. Thursday 22nd June 2017. 60103 'FLYING SCOTSMAN', Taunton Station, Friday 26th May 2017. 45407, 45212 & 62005. "The Jacobite", West Highland Railway. Thursday 4th May 2017. 37057, Exeter St Davids Station. Thursday 9th February 2017. 68003 & 68019, "The Armada", Plymouth Station, Saturday 22nd October 2016. 46233 & 47580, "The Royal Duchy", Sunday 28th August 2016. 6201, "The Cathedrals Express", Taunton Station, Tuesday 23rd August 2016. 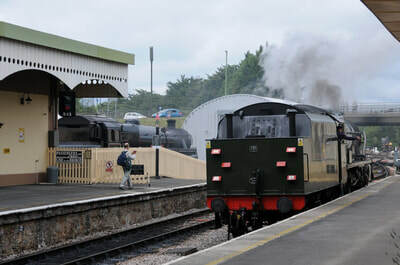 45699, "The West Somerset Steam Express", Taunton Station. Saturday 13th August 2016. 46233, "The Royal Duchy", Plymouth, St Blazey & Par. Sunday 7th August 2016. 73962 & 73963 TnT 73107 & 73128, "The Herd of Wildebeeste", Exeter St Davids Station. Saturday 16th July 2016. 66743 & 66746, Belmond "Royal Scotsman Tour Of Britain", Newton Abbot Station. Tuesday 12th July 2016. 68020 TnT 68004, Test Train 1Q18, St Budeaux Ferry Road Station. Friday 1st July 2016. 68016 TnT 68017, "The Northern Belle", Bodmin Parkway Station. Saturday 4th June 2016. 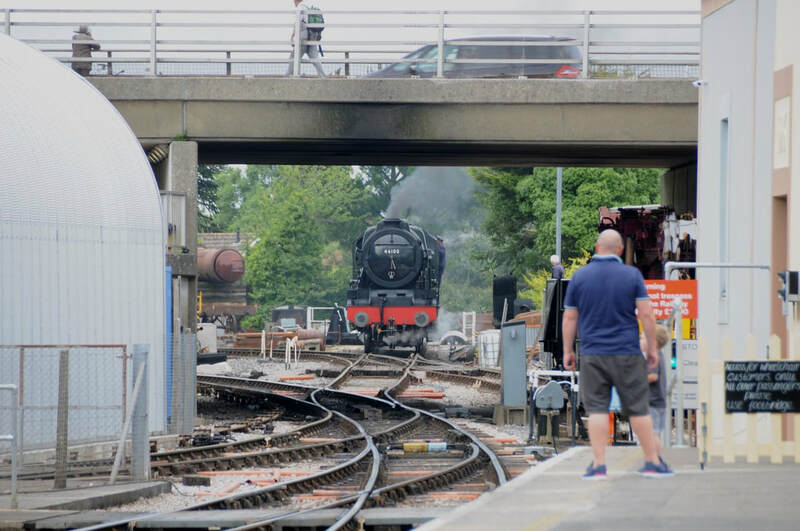 60103 'FLYING SCOTSMAN', Salisbury Station. Saturday 28th May 2016. 37219, St Budeaux Ferry Road Station. Wednesday 18th May 2016. 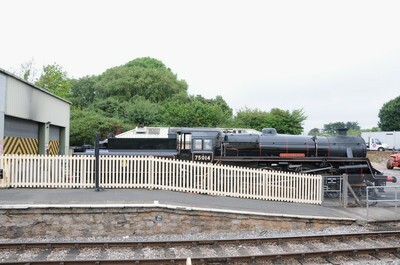 D1015, "The Western Challenger", Plymouth Station & Dartmoor Railway. Saturday 7th May 2016. 46100 'ROYAL SCOT', "The Great Britain IX", St Budeaux Ferry Road & Plymouth Station. Wednesday 27th April 2016. 46100 'ROYAL SCOT', "Great Britain IX", Dawlish Warren, Tuesday 26th April 2016. 47830, Laira Junction. Saturday 9th April 2016. 37025 'Inverness TMD', Bristol Parkway & Cardiff Central Stations. Thursday 18th February 2016. 60047 near Ivybridge. Saturday 30th January 2016. 56098 & 56301. The Embankment, Plymouth. Saturday 30th January 2016. 37057 at Plymouth Station. Thursday 21st January 2016. 56098 & 56301, Laira Depot, Plymouth. Sat.12thDec.2015. 61306 'MAYFLOWER' & 47746 'Chris Fudge 29.7.70 - 22.6.10', "The Cathedrals Express", Thursday 26th November 2015. "First Devon and Exeter Explorer", Saturday 10th October 2015. 37218 & 37425, "The Autumn Chieftain" ECS, Tiverton Parkway. Tuesday 29th September 2015. 57601 TnT 57316, "Dartmouth Regatta Statesman", Saturday 29th August 2015. 34067 'TANGMERE', "The Royal Duchy", Sunday 2nd August 2015. D9009 'ALYCIDON', 57303. Dawlish & Exeter St Davids. Saturday 4th July 2015. 57311 'Thunderbird'. Plymouth Station. Tuesday 9th June 2015. 70000 'BRITANNIA' Dartmouth Steam Railway. Friday 15th May 2015. 66741 hauls 56006, 50035, 45060 & 37057 to Didcot Railway Centre. Tuesday 12th May 2015. 37605 & 37059, "The Devon Explorer". Saturday 25th April 2015. 67006, "Royal Albert Bridge". Fri. 17th April 2015. 67018 TnT 67012 at Plymouth Station. Friday 17th April 2015. 61306 'MAYFLOWER', Dawlish Warren. Wednesday 1st April 2015. 50007 & 50050. Taunton Station. Friday 13th February 2015. 70804 TnT 70801, St Budeaux, Ferry Road Station. Sunday 25th January 2015. 70803 TnT 70805. Par Station. Sunday 11th Jan. 2015. New GBRf Class 66s at Gloucester Station. Tuesday 9th December 2014. New GBRf Class 66s at Gloucester Station. 8th September 2014. 34067 with the "ACE". Exeter Central. Fri.5thSept.2014. 5 New GBRf Class 66s at Gloucester Station. Sat.12thJuly2014. 70809 & 56078, Newton Abbot Station. Tuesday 3rd June 2014. A4 60009 'UoSA' to York. Thursday 22nd May 2014. 70807 & 70804 at Plymouth Station. Thurs.15th May 2014. 37423 working Flask Train, Keyham Station, Thurs.15th May 2014. 5029 'NUNNEY CASTLE', "The Anniversary Limited", Friday 9th May 2014. 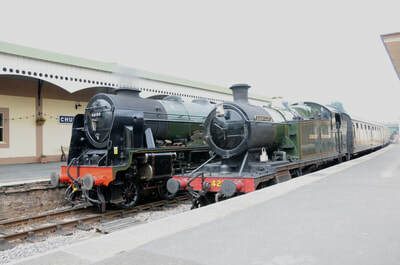 "The Devonian" & "The Great Britain VII" at Exeter St Davids & Plymouth Station. Saturday 26th April 2014. 60007 'SIR NIGEL GRESLEY', "The Dartmouth Express", Sat.19th April 2014. 60007 'SIR NIGEL GRESLEY', "The Cathedrals Express". Thurs.10th April 2014. 31190 & 47769 'Resolve', Cowley Bridge Area. Friday 22nd.Nov.2013. 86259 & 46115, "The Cumbrian Mountain Express", Wednesday 16th.October 2013. 34046 'BRAUNTON', "The Royal Duchy", Sunday 29th.Sept.2013. 70013 'OLIVER CROMWELL', "The Dorset Coast Express". Weds.31st.July 2013. 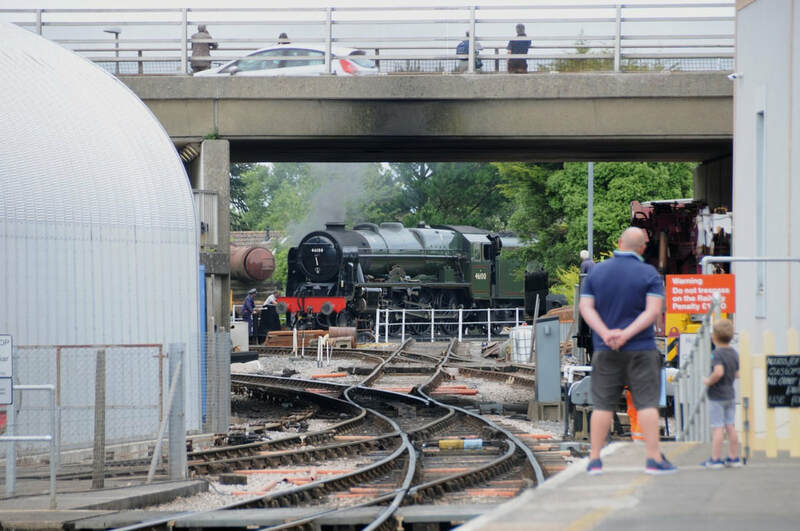 34067 'TANGMERE', "The Devonian" Thursday 4th.July 2013. D9009 'ALYCIDON'. Saturday 29th.June 2013. 60009 'UoSA' hauling "The Royal Duchy" 9th.June 2013. 47786 & 47854 haul the "Cornish Riviera Statesman". Saturday 11th.May 2013. 60009 'UNION OF SOUTH AFRICA' The Cathedrals Explorer. Friday 10th.May 2013. 35028 'CLAN LINE' "The Cathedrals Explorer" Thursday 9th.May 2013. 34067 'TANGMERE', 45407 'THE LANCASHIRE FUSILIER' & 44871 hauling "The Great Britain VI". Saturday 20th.April 2013. 34067 'TANGMERE', "The Atlantic Coast Express", at Exeter St Davids, Sunday 7th.April 2013. 60163 'TORNADO' hauling "The Cathedrals Express". Saturday 9th.March 2013. 37609, 37218 & 37608 hauling "The Hullaba-Looe". Sunday 10th.February 2013. London Trip. Saturday 8th.December 2012. 34067 hauling "The Royal Duchy" down past the Teign Estuary. Sunday 16th.September 2012. 4464 'BITTERN' hauling "The Torbay Express". Sunday 16th.September 2012. 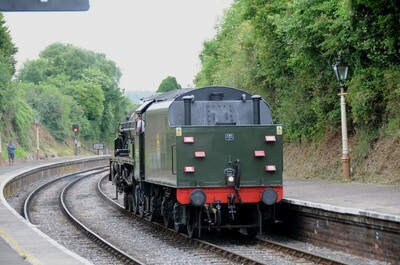 4464 & 70000 haul "The Mayflower" on the approach to Totnes Station. Saturday 15th.September 2012. 37423 with 2Z02. Keyham Station. Wednesday 15th.May 2013. 56303 at Plymouth Station. Friday 12th.April 2013. Steam Railmotor No.93, Liskeard Station. Sunday 11th.November 2012. 4936 'KINLET HALL' working LE up Dawlish Seawall. Monday 1st.October 2012. 34067 'TANGMERE' hauling "The Royal Duchy" down the Dawlish sea wall. Sunday 9th.September 2012. (6 Photos). 87017 & 87023 move. Tuesday 28th.August 2012. 60044 & 60100 enroute to St Blazey. Thurs. 3rd.May 2012. 37259 & 37604 at St Budeaux, Ferry Rd Station. Thurs.3rd.May 2012. 70013 'OLIVER CROMWELL' hauling "The Royal Duchy" at St Budeaux, Ferry Road Station. Sunday 12th.August 2012. 70013 'OLIVER CROMWELL' hauling "The Royal Duchy" at Plymouth. Sunday 29th.July 2012. 37609 & 37606 with "The 3-2-C" at Plymouth Station. Saturday 9th.June 2012. 47500, 34067 'TANGMERE' & 70013 'OLIVER CROMWELL' haul "THE ROYAL DUCHY". Saturday 5th.May 2012. 35028 'CLAN LINE' hauling "The Cathedrals Express". Thurs.3rd.May 2012. Eight Classes of Locomotives at Cheltenham Spa Station. Thursday 29th.March 2012. 60163 'TORNADO' & 66152 haul "The Cathedrals Express". Saturday 10th.March 2012. 56302 & 47375 at St.Budeaux, Ferry Road Station. Thursday 8th.March 2012. 37606 & 37607 with 1Z13. Plymouth Station. Wednesday 11th.January 2012. (Updated120112). 37423 'Spirit of the Lakes' stabled at Plymouth Station. Tuesday 13th.December 2011. (4 Photos). 37602 & 37606 stabled in Laira Yard, Plymouth. Tuesday 6th.December 2011. (7 Photos). Updated 071211. 47375 & 56302 hauling 6Z23 at St.Budeaux, Ferry Road Station. Wednesday 30th.November 2011. 4492 & 5029 hauling "THE MAYFLOWER". Saturday 17th.September 2011. Updated 101109. 33207 'Jim Martin' collecting 34067 'TANGMERE'. Taunton. Thursday 8th.September 2011. 47500 & 70000 hauling the "THE ATLANTIC COAST EXPRESS". 4th.&6th.September 2011. 48151 hauls "The Fellsman", Carlisle Station. 310811. 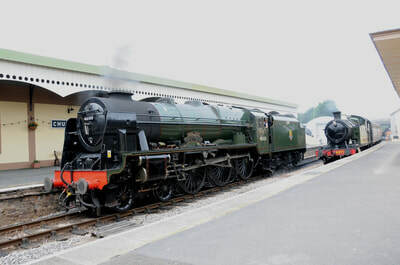 47790 & 47832 with the "NORTHERN BELLE" at Paignton Station. Friday 26th.Aug. 2011. 37423 'Spirit of the Lake', Test Train. Exeter St Davids Station. Thurs.21st.Jul.2011. (4 Photos). 5029 'NUNNEY CASTLE', St Budeaux, Ferry Road Station. Sun.10th.July 2011. (2 Photos). D7535, The Dartmouth Steam Railway. Sat.9th.Jul.2011. (8 Photos). 55022 & 47804, "The Devonian". Paignton Station. Sat.9th.Jul.2011. (13 Photos). 60163 'TORNADO', "The Torbay Express", Paignton Station. Sun.3rd.Jul.2011. Class 2MT 41312, South Devon Railway. Wednesday 10th October 2018. 6023 'KING EDWARD II', Kingswear for Dartmouth Station. Tuesday 4th September 2018. "Spring Diesel Gala", Severn Valley Railway. Saturday 19th May 2018. "Spring Steam Gala", Severn Valley Railway, Saturday 17th March 2018. "Diesel Gala 2017", Bodmin & Wenford Railway, Saturday 16th September 2017. 60103 at Minehead, West Somerset Railway. Tuesday 12th September 2017. Class 37 6975, "Rails & Ales", South Devon Railway. Saturday 26th August 2017. Didcot Railway Centre. Monday 21st August 2017. 50042, Bodmin & Wenford Railway. Saturday 5th August 2017. 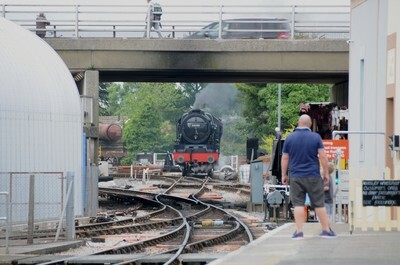 60163 'TORNADO', Bodmin Parkway. Sunday 4th June 2017. 2807, 35006 at "Steam Gala", Gloucestershire & Warwickshire Railway. Bank Holiday Monday, 29th May 2017. 5526 at Totnes Riverside, South Devon Railway. Friday 26th May 2017. "Spring Diesel Festival", Severn Valley Railway. Saturday 20th May 2017. "Spring Steam Gala", West Somerset Railway. Saturday 29th April 2017. 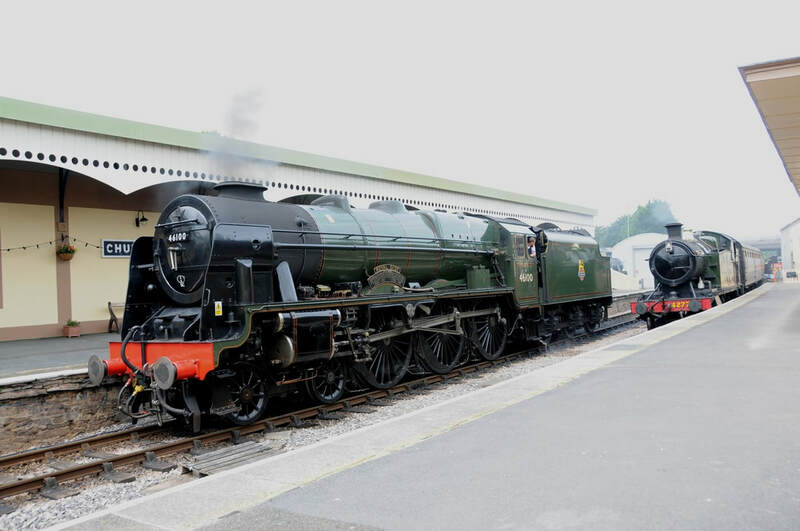 6975 & 5542, "Easter Heritage Gala", South Devon Railway. Easter Monday 17th April 2017. "Strictly Bulleid Spring Steam Gala", Swange Railway. Saturday 1st April 2017. 6435, Bodmin & Wenford Railway. Saturday 31st December 2016. 75014, Dartmouth Steam Railway. Wednesday 14th December 2016. "Giants of Steam", Bluebell Railway, Friday 28th October 2016. "Summer Diesel Gala", Midland Railway - Butterly. Saturday 23rd July 2016. "Heritage Diesel Weekend", Gloucestershire Warwickshire Railway. Saturday 30th July 2016. 7820 & Devon Belle Observation Car, Paignton & Dartmouth Railway. Saturday 16th July 2016. 37142 & 50042, Bodmin & Wenford Railway. Saturday 4th June 2016. "Spring Diesel Festival", Severn Valley Railway. Saturday 21st May 2016. "Easter Heritage Gala", South Devon Railway. Good Friday 25th March 2016. "Spring Steam Gala", West Somerset Railway. Thursday 10th & Saturday 12th March 2016. "Winter Steam Gala", South Devon Railway. Monday 15th February 2016. "Winter Diesel Gala 2015", South Devon Railway. Saturday 7th November 2015. "Open Weekend", Tyseley Locomotive Works. Saturday 24th October 2015. 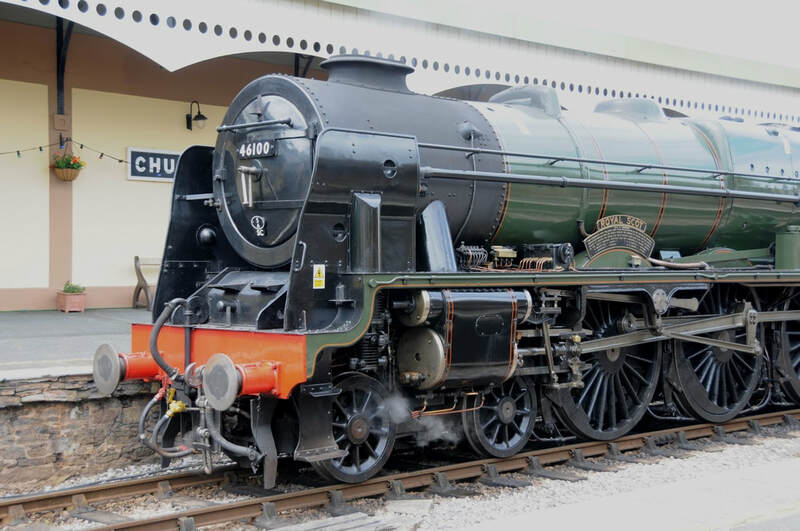 "Autumn Steam Gala 2015", West Somerset Railway, Saturday 3rd October 2015. "Autumn Diesel Gala 2015", Bodmin & Wenford Railway. Saturday 26th September 2015. "Autumn Steam Gala", Severn Valley Railway. Sat.19thSept. & Sun.20th.Sept. 2015. "Heritage Transport Gala & Behind the Scenes", South Devon Railway. Sat.12thSept.2015. 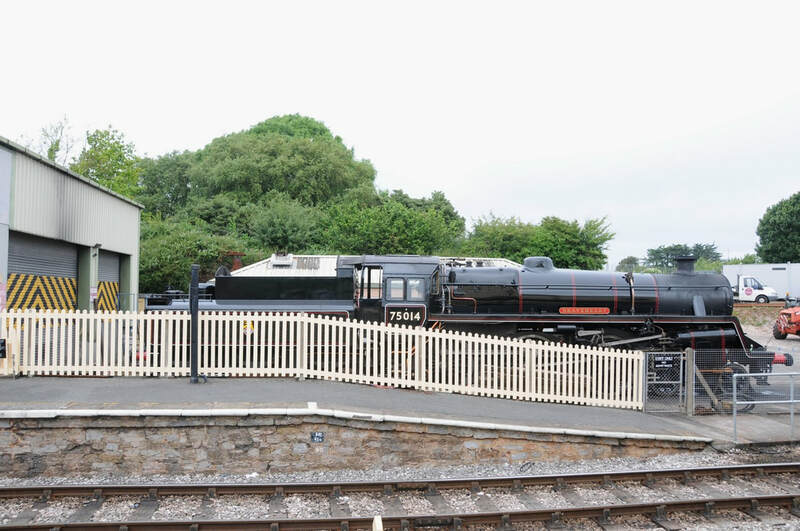 Helston Railway, Thursday 10th September 2015. "Autumn Steam Gala", Bodmin & Wenford Railway, Fri.4th & Sun.6th Sept.2015. 37142 Bodmin & Wenford Railway. Saturday 20th June 2015. "Heritage Transport Festival". Bodmin & Wenford Railway. Saturday 13th June 2015. "Mixed Traction Gala", West Somerset Railway. Saturday 6th June 2015. "1960s Gala & Spring Ale Festival". South Devon Railway. Friday 22nd May 2015. Barrow Hill "Rarities" Diesel Gala. Saturday 18th April 2015. Easter Heritage Gala, "Delivering the Goods". SDR. Sat.4th & Mon.6th April 2015. "Spring Steam Gala", West Somerset Railway. Thursday 26th March 2015. South Devon Railway, Half-Price Weekend. Sunday 22nd March 2015. Llangollen Railway. "Steel, Steam & Stars IV", Sat.7thMarch2015. Keighley & Worth Valley Railway, "Winter Steam Gala".Sat.28thFeb.2015. Branch Line Week, South Devon Railway. Fri.20thFeb.2015. Branch Line Week, South Devon Railway. Sat.14thFeb.2015. L92 (5786), "MInce Pie Special", South Devon Railway. Tuesday 30th December 2014. 1442 at Tiverton Museum. Monday 24th November 2014. Diesel Gala, SDR. Saturday 8th November 2014. Ribble Steam Railway, Saturday 1st November 2014. "Victorian Weekend", B&W Railway. Saturday 11th October 2014. Diesel Gala, B&W Railway. Sat. 27th September 2014. Great Central Railway. Saturday 26th July 2014. "Military Weekend", SDR. Saturday 5th July 2014. "Diesels in the South West", WSR. Fri.6th & Sun.8th June 2014. 1960's Gala & Real Ale Festival. South Devon Railway. 24th & 26th May 2014. "The Bulleid is Back" Gala, Bodmin & Wenford Railway. 3rd & 5th May 2014. "Easter Heritage Gala", South Devon Railway, 18th & 21st April 2014. 46521 & 37275, South Devon Railway. Weds. 16th April 2014. 37275 arriving at South Devon Railway. Tuesday 8th April 2014. Half Price Weekend, South Devon Railway. Sat.5th April 2014. Spring Steam Gala 2014, West Somerset Railway. 28th-29th March 2014. South Devon Railway, Winter Branch Line Gala. Sat.22nd.Feb.2014. Plym Valley Railway, 50017, Sun.17th.Nov.2013. Bodmin & Wenford Railway, "Victorian Weekend". Fri.11th.-Sun.13th.October 2013. Autumn Steam Gala 2013, West Somerset Railway. Sat.5th.Oct.2013. Severn Valley Railway, Autumn Steam Gala. Sat.21st.Sept.2013. South Devon Railway, "Behind the Scenes and the Heritage Transport Gala" Sat.14th.Sept.2013. West Somerset Railway, "Late Summer Weekend", Sat.31st.Aug.2013. Bluebell Railway Visit. 31st July 2013. A4's at NRM, York. Thursday 11th.July 2013. 50017 'Royal Oak'. Plym Valley Railway. Sunday 23rd.June 2013. 37142. Bodmin & Wenford Railway. Saturday 22nd.June 2013. Mixed Traction Weekend. West Somerset Railway.Saturday 8th.June 2013. Cotswold Steam Celebration, GWR, Monday 27th.May 2013. 1960's BR Gala. South Devon Railway. Saturday 25th.May 2013. 37142, Bodmin & Wenford Railway. Saturday 18th.May 2013. Mid-Hants Diesel Gala Fleet. Thursday 25th.April 2013. West Somerset Railway Spring Steam Gala. Sat.23rd.March 2013. Branch Line Gala, South Devon Railway. Monday 18th.February 2013. Plym Valley Railway. Sunday 30th.December 2012. Steam Railmotor No.93 at Bodmin & Wenford Railway. Friday 12th.October 2012. West Somerset Railway Autumn Steam Gala 2012. Sunday 7th.October 2012. Heritage Transport Gala, South Devon Railway. Sunday 16th.September 2012. Mixed Traction Gala, West Somerset Railway. Sunday 17th.June 2012. 50017 'Ark Royal' at Plym Valley Railway. Saturday 9th.June 2012. Railfest, York. Saturday 2nd.June 2012. Swanage Railway, Diesel Gala. Friday 11th.May 2012. The Fab Four Steam Gala "Preview", Barrow Hill. Thursday 12th.April 2012. South Devon Railway, Easter Heritage Gala. 6th.& 9th.April 2012. West Somerset Railway Spring Steam Gala. March 2012. South Devon Railway. Sunday 12th.February 2012. (4 Photos). South Devon Railway Diesel Gala. Saturday 5th.November 2011. Updated 251111. South Devon Railway. Sunday 30th.October 2011. "Deltic Gathering" at East Lancashire Railway. Saturday 15th.October 2011. Severn Valley Railway Diesel Gala. Saturday 8th.October 2011. Bodmin & Wenford Railway Diesel Gala. Sunday 25th.September 2011. Bodmin & Wenford Railway Steam Gala Visit. Sunday 4th.Sept.2011. 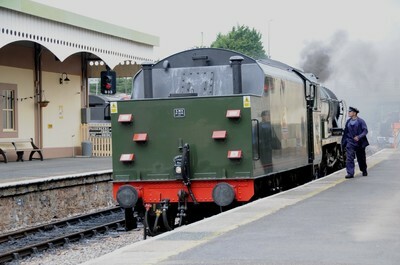 D832 at West Somerset Railway. Saturday 27th.August 2011. South Devon Railway, Rails & Ales Gala. Friday 26th.August 2011. 7827 'LYDHAM MANOR', Dartmouth Steam Railway. Sat.9th.Jul.2011. 50042, 33110 & 47306. Bodmin & Wenford Railway. Fri.24th.Jun.2011. 68017 'Hornet' & 68005 'Defiant' at Bridgwater Yard & Station. Wednesday 21st November 2018. 43172, 1A16, Totnes Station. Wednesday 10th October 2018. 70816, 6C35, Plymouth Station. Wednesday 10th October 2018. 68034 & 68033 at Bridgwater Yard & Station. Tuesday 30th January 2018. Barrow Hill Grand Reopening Preview. Thursday 21st September 2017. Old Oak Common Depot "Open Day", Saturday 2nd September 2017. Westbury Station & Yard, Thursday 17th August 2017. Eastleigh Station Yard. Thursday 17th August 2017. 68003 & 68027. Bridgwater. Thursday 17th August 2017. Eastleigh Station. Tuesday 15th August 2017. 68016, 68027 & 37403 at Bridgwater. Thursday 3rd August 2017. DRS Charity Open Day Kingmoor Depot, Carlisle. Saturday 22nd July 2017. DB Red 66185, 6C53, Plymouth Station. Thursday 22nd June 2017. 800003 & 800004, Liskeard Station. Thursday 22nd June 2017. 70817 (6C36) & others, Liskeard Station. Thursday 22nd June 2017. 68023 & 68025 at Bridgwater. Friday 26th May 2017. 92038, London Euston Station, Friday 5th May 2017. 73966, Edinburgh Waverley & Fort William Station. Thursday 4th May 2017. 92014, London Euston Station. Weds. 3rd May 2017. 153368, Plymouth Station. Easter Monday 17th April 2017. 70806, 6C35, St Budeaux Ferry Road Station. Wednesday 12th April 2017. 66848 tnt 66846, St Budeaux Ferry Road Station. Wednesday 12th April 2017. 91101 & 91110 at London Kings Cross Station. Monday 6th March 2017. 70808, Plymouth & Liskeard Stations. Wednesday 30th November 2016. 68024 'Centaur', Totnes Station. Friday 25th November 2016. 37254 + Test train, Riverside Yard, Exeter. Wednesday 2nd November 2016. Stafford Station, Tuesday 26th July 2016. 60007, 66750 at Westbury & 66710 at Eastleigh Station. Thursday 26th May 2016. 43002, London Paddington Station. Thursday 5th May 2016. 43022, 43172 & 43026, St Budeaux Ferry Road Station. Thursday 14th April 2016. 60039 'Dove Holes', Tiverton Parkway Station. Thursday 17th March 2016. 43172 'Harry Patch' at Plymouth Station. Sunday 3rd January 2016. 60009 'UoSA' in South Devon Works. Saturday 29th August 2015. 66118 hauls 6C10, St Budeaux Ferry Road Station. Wednesday 17th June 2015. Eastleigh Station. Monday 18th May 2015. 70809, 66850, 70803, 70808 & 70807 St Budeaux Ferry Road Station. Sunday 17th May 2015. 20305, 20309 & 60076. Bridgwater. Thursday 7th May 2015. Class 20 No.3 (20906), Hope Valley. Saturday 18th April 2015. 70804 at Newton Abbot Station. Weds. 1st April 2015. Class 37s at Cheltenham Spa Station. 8th & 9th Dec.2014. Tavistock Yard. Wednesday 26th November 2014. Midlands Day Trip. Wednesday 24th September 2014. Etches Park Open Day. Saturday 13th September 2014. Stafford Station. Tues.15th & Thurs.24th July 2014. DRS Gresty Bridge Charity Open Day. Sat.19th July 2014. Crewe Station. Thursday 24th April 2014. Nuneaton & Rugby Station Visits. Fri. 27th.Sept.2013. Nuneaton Station Visit. Tuesday 10th.September 2013. Bristol Temple Meads. Friday 16th.August 2013. Cheltenham Spa Station. Friday 16th.August 2013. London Kings Cross & Doncaster Stations. Thursday 11th.July 2013. Diesel Convoy, Didcot Parkway.Tuesday 21st.May 2013. 17 Photos. Eastleigh Station & Yards. Thursday 25th.April 2013. 60019, 56105, 37425, 37194 & 37259 at Cheltenham Spa. Tuesday 20th.April 2013. 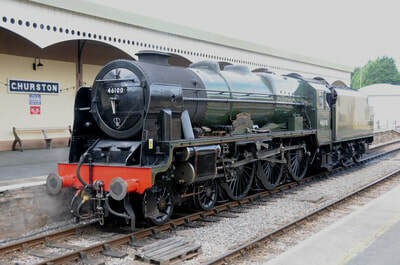 Black Fives 44871 & 45407 at Plymouth Station. Sunday 21st.April 2013. 56105 working 6Z53 Colas Loaded Logs at Newton Abbot. Thursday 18th.April 2013. Workings through St Budeaux, Ferry Road Station. (3 Photos). Updated 180313. 66132 hauls 6Z17 down St Budeaux, Ferry Road Station. Monday 4th.Feb.2013. 56094 with 6Z53 Loaded Log Train. Thursday 13th.December 2012. Kensington Olympia Station. Saturday 8th.December 2012. Colas 56087 at Newton Abbot Station. Thursday 8th.Nov.2012. London Trips. Monday 22nd. & Thursday 25th.October 2012. Eastleigh Station Visit. Friday 19th.October 2012. Station Visits. Tuesday 16th.October 2012. Dollands Moor & London Trip. Thursday 4th.October 2012. 56094 hauling 6Z52 down Dawlish seawall. Wednesday 26th.September 2012. 56094 working 6Z53 at Newton Abbot Station. Thursday 20th.September 2012. 56094 hauling 6Z52 at Newton Abbot Station. Wednesday 19th.September 2012. DRS Charity Open Day, Gresty Bridge Depot, Crewe. Saturday 18th.August 2012. Didcot Parkway Station. Sunday 3rd.June 2012. Newport Station. Thursday 29th.March 2012. Eastleigh Station & Yards. Tuesday 6th.March 2012. Nuneaton Station Visit. Monday 5th.March 2012. (32 Photos). Bristol Parkway, Bristol Temple Meads & Filton Abbey Wood Station Visits. Thursday 1st.March 2012. Newport, Bristol Parkway & Bristol Temple Meads Station Visits. Wednesday 29th.February 2012. Eastleigh Area Visit. Friday 24th.February 2012. Updated 090312. Bristol Parkway Station, Thursday 23rd.February 2012. (20 Photos). Bristol Parkway Station, Tuesday 21st.February 2012. (12 Photos). 70014 in Stoke Gifford Yard. Monday 20th.February 2012. (2 Photos). 43055 at Plymouth Station. Thursday 9th.February 2012. (3 Photos). 66850 hauling 6Z51 Loaded Log Train at Newton Abbot Station. Weds.1st.February 2012. (6 Photos). 150126 at Plymouth Station. 010212. 66847 at Newton Abbot Station. Wednesday 7th.December 2011. Workings through St.Budeaux, Ferry Road. (5 Photos). Updated 080212. Derby Station & Toton Bank Visit. Tuesday 20th.September 2011. Eastleigh Area Visit. Thursday 15th.September 2011. Updated 071011. Exeter St.Davids Workings. Updated 060911. Glasgow Central Station. Tuesday 30th.August 2011. Carnforth Station & Yard. Monday 29th.August 2011. Cheltenham Spa, Cardiff Central, Newport Stations. Fri.19thAug. & Mon.22nd.Aug.2013. (25 Photos). Harrow & Wealdstone, Marylebone, Kings Cross & Stratford Stations. Weds.3rd.Aug.2011. (20 Photos). Plymouth Area, Various Workings. August 2011. (14 Photos). St Budeaux, Ferry Road Station. Friday 29th.Jul.2011. (4 Photos). 57605 'Totnes Castle', Plymouth Station. Weds.27th.July 2011. (4 Photos). Harrow & Wealdstone, Marylebone, Kings Cross, Bowes Park, Willesden Junction & Stratford Stations. Tues.26th.July 2011. (33 Photos). 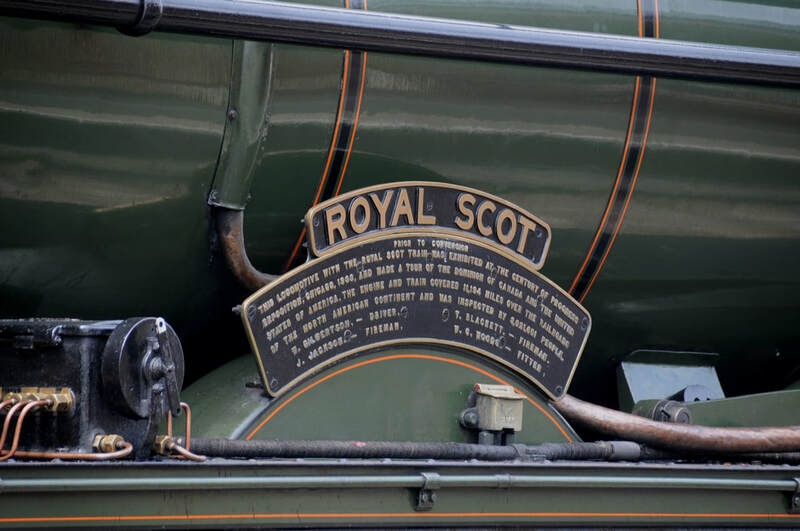 Class 7P 4-6-0 46100 'ROYAL SCOT' hauled tour "The Dartmouth Express" from Bristol Temple Meads to Kingswear and back to Norton Fitzwarren on Saturday 24th June 2017. Here a some photographs of the locomotive I captured when it had to run light engine back to Churston to be turned on the turntable there. (12 Photos). A larger image, with a caption, can be viewed by left clicking on a photograph below. Then the collection can be navigated through.